There are mainly three ways that you can, on your own, refresh your old car. In brief, these three ways involve making the car look new outside and inside, giving the car a fresh scent and ensuring it runs in good condition. To make your car look brand new on the outside, you simply have to refresh its paint. This does indicate washing the car. Refreshing car paint involves removing the effect of weather exposure. Car paint becomes brittle after being exposed to extremes of heat and coldness. Just as equally, car paint deteriorates when exposed to too much rain. It is not just the water that acts on paint but also the chemicals that are contained in raindrops. There are many types of car paint refreshers that are sold in stores. The first category includes car cleaners. You have cleaners that work by friction to even up the texture of the paint. Actually, the paint of your car is made up of a series of depressions and ridges. The more pronounced these formations are, the duller will the texture of your car paint be. Friction cleaners, level up the surface of your car paint. By grinding out the ridges and filling the depressions with them. There are also, chemical cleaners. This type of cleaner is good for removing foreign substances, such as bits of insects that are embedded in the paint. Chemical cleaners are also good for removing old was, sap from trees and stains from car paint. The second category of finishers are called glazes. A glaze is an extra-fine friction cleaner which may be combined with ingredients used to make chemical cleaners. It will also usually contain oils and emollients to correct flaking of car paint. Glazes are excellent for removing slight scratches and uneven textures in the paint, as well as for applying a shiny finish to it. Polishes are normally non-abrasive agents for giving the car paint more shine. These are normally made of wax. They may also contain fillers that are effective for smoothing out uneven strokes in the car paint. Car waxes may be either organic (derived from plants) or synthetic. 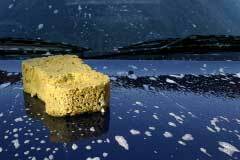 To remove extraneous material from car paint you need to use degreasers and tar removers. These agents work on any tar that got stuck in your car paint when they were thrown up from the road by the tires. Insects and sap from trees and leaves are also removed by these chemicals. Another name for these substances are solvents. They may be citrus based or derived from petroleum. The ones made from citrus extracts are milder for car paint. All of them remove wax form the paint so you will have to re-treat your paint with polishes are using solvents to remove impurities in the paint. Additionally, petroleum based degreasers may damage car paint permanently. So be sure that your degreaser is a citrus based one. When do you refresh your car? If it hardly moves out of your garage, maybe once a year refreshing it will do for the car. If the car is used every day, the need to clean it will be something done on a case to case basis. Bird droppings are acidic and will have to be removed as soon as you can with a degreaser, followed by car polish. In general, only apply cleaner to parts of the car that need it. Polishing the car can be done more often and for all its painted areas. Besides safety considerations, there are many reasons why you should not drive an overloaded vehicle.